If you haven’t seen the High-five board this week, you’re missing out. 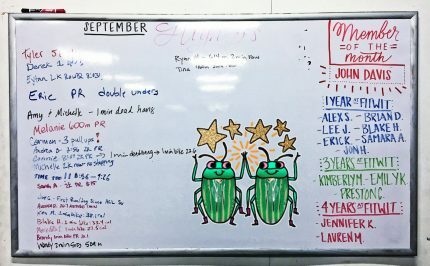 Lots of personal records (PRs) on the board. Which leads us to the topic for today – PRs. When we first start out at FitWit, PRs come relatively quick and easy. Many of us start out a bit de-conditioned, so after only a few months of strength and conditioning work in the classes, we see sharp improvementsin things like the mile run or 2k row. It seems like every workout is an improvement upon the last one. This may go on for weeks as you’re getting stronger and moving better. Soon, you find yourself calculating that if you continue to drop your mile time by 20 seconds each attempt, you’ll own the world record by early December. Oh, the places you’ll go! It’s not going to be easy. It’s not supposed to be easy. Remember, this is your personal record – the best you’ve ever done. Many times, hitting your next PR will require additional work outside of class. You will try very hard, and still not hit a PR most days. That’s ok. It’s normal. Kick a rock, cuss under your breath and then be done with it. Smile knowing that you live to fight another day. Sometimes, it’s helpful to reset your PRs based on where you are in life. You may never beat your high school mile time, but maybe you set a post-30 yr old PR. Or a post-baby PR. Or post ACL surgery PR. When you do hit a PR, celebrate it! Put it on the board. Tell a coach. Fist pump. Sound your barbaric yawp over the rooftops of the world. You earned it. Now, how bout some weekly news? 10:15 am mobility class tomorrow – Tomorrow, the normal Saturday 10:15 am class becomes a mobility class. Be there to work on moving and feeling better! October Challenge – The monthly challenge for October is . . . Running! Run a marathon (26.2) broken up throughout the month and earn your October challenge badge. BUT, you must warm-up first with a specific guided routine we’ll post on Monday (Oct 1). Stay tuned. * Improved control of lifts. * Development of connective tissue strength. Love or Work – Erin and I are on the Love or Work Podcast this week to discuss if it’s possible to change the world, stay in love and have a healthy family life. We talk all things building – a better family, a better gym and a better relationship with each other . . . AKA Erin offering sound advice and Josh rambling. Halloween Party, Oct 26 – Save the date for a gym Halloween party and movie night. FitWit Kids FREE Week – Next week we’re hosting a Bring a Friend Week at all of our FitWit Kids classes. Please share with your networks who might benefit. Sign up for a free class here. Thanks! Fat loss or muscle gain goal? – If you have a fat loss or muscle gain goal, the InBody test will give you some valuable data to help you refine your plan and maximize success. All FitWit members save a little cash too by signing up here with the coupon codes in the camp news email.